You are attending a departmental event when you walk over to a group of your colleagues, and the conversation goes silent. You wonder if you had that effect on the conversation, but the awkward silence is reluctantly broken by the person who was speaking when they quietly continue their story. This veteran physician discusses a recent incident where they placed a wrong-sized lumen chest tube in a patient, only to have to replace it afterwards. In what seems to be a sign of moral support, a veteran nurse shares a story where they gave the wrong patient medication. This opens the door to many more people sharing their own incidents that occured recently. You walk away thinking about how secretive this conversation was, and wonder why these patient safety incidents aren’t being shared with the entire group so that others learn from them, and that the system and processes that led to these incidents can be improved such that these patient safety incidents can be mitigated in the future. Welcome back to our third post on patient safety in the ED. In the first two parts of the series, we introduced the systems approach to patient safety. In this post, we discuss the role that ED culture has in supporting (or hindering) patient safety. What is the patient safety culture? 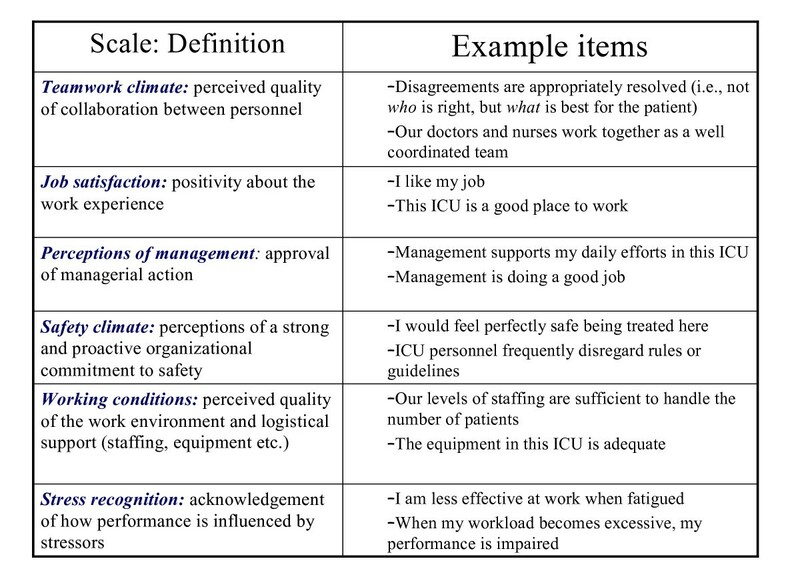 Patient safety culture is a component of organizational culture that “includes the shared beliefs, attitudes, values, norms and behavioural characteristics of employees, and influences staff member attitudes and behaviours in relation to their organization’s ongoing patient safety performance”.1 While it may be difficult to completely separate ED patient safety culture from the overarching organizational culture, different clinical units may have differences in their subcultures, which provide opportunities for local improvement and leading by example. An improved patient safety culture has been associated with reduced patient harm2,3 a perception of better care by patients and family members, and reduced staff burnout. Front line staff in ‘safe’ environment are more likely to report errors.4,5,6,7 Overall, creating this type of culture enhances the work environment and shape staff perceptions about ‘normal’ behaviour related to patient safety in their work area.8 All in all, it is a big deal! How do you measure your patient safety culture? Figure 1. Adapted from The Safety Attitudes Questionnaire. The 6 components of the Safety Attitudes Questionnaire. The key point in utilizing these questionnaires is that stakeholder engagement, particularly front-line staff, is important in identifying the barriers that exist and key opportunities for improvement in an organization’s safety culture. Therefore, an ED culture that promotes patient safety is built on transparency, empowered frontline staff, a non-blaming environment, an organizational learning culture, and invested leadership. Developing this culture requires wide stakeholder engagement and interprofessional collaboration with the patient at the forefront. How is the culture in your institution? Are front line staff empowered to report incidents, and do others learn from them? Is there regular sharing of this information? In summary, the patient safety programs need to be embedded in health culture that supports them. Patient safety cultures have been shown to have beneficial effects on patients, frontline staff, and the organization. Moreover, there are evidence based strategies to measure and to optimize the patient safety culture. Now that you have been empowered with this information, you are able to discuss this at your next ED business meeting and slowly start to create a safer environment where staff are reporting, learning, and improving patient safety. Stay tuned to our next post where we dive deeper into one aspect of patient safety and discuss the risky business of patient handovers. Wade J. Reflections on Building a Safer System. In: Ottawa, ON; 2014. Sorra JS, Nieva VF. Hospital Survey on Patient Safety Culture. Agency for Healthcare Research and Quality; 2004:41. http://www.ahrq.gov/professionals/quality-patient-safety/patientsafetyculture/hospital/userguide/hospcult.pdf. The CUSP Method . Agency for Healthcare Research & Quality. https://www.ahrq.gov/professionals/education/curriculum-tools/cusptoolkit/index.html. Accessed March 15, 2019. Patient Safety Culture. Canadian Patient Safety Institute. https://www.patientsafetyinstitute.ca/en/toolsResources/PatientSafetyIncidentManagementToolkit/PatientSafetyManagement/pages/patient-safety-culture.aspx . Accessed March 15, 2019. Ryan is a senior Emergency Medicine resident from McGill University and is currently completing a Masters of Public Health at Johns Hopkins in Quality Improvement and Health Informatics. Ahmed is a senior Emergency Medicine Resident at the University of Toronto. He has completed a Masters of Public Health at Johns Hopkins Bloomberg School of Public Health with certificates in Quality Improvement & Patient Safety, as well as Public Health Informatics. Dr. Amy Cheng is an emergency physician at St. Michael’s Hospital (SMH) at the University of Toronto. She obtained an MBA with a focus on social entrepreneurship. She is passionate about improving the quality of patient care and safety, and currently serves as the ED Director of Quality Improvement at SMH, and was the Medical Director for Quality Improvement and Patient Safety for SMH. She led the development of the top 10 Choosing Wisely Canada recommendations for emergency medicine as the co-chair of the Canadian Association of Emergency Physician (CAEP) Choosing Wisely Canada working group.